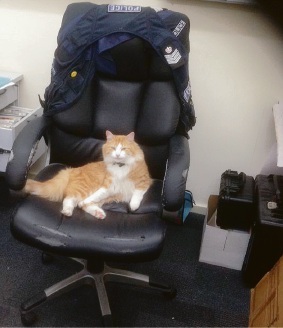 MUNDIJONG Police Station has the purr-fect new recruit. Constable Kitty has been lying around the station for more than six months and has become the star of the station’s Twitter page. The cat has been spending time eating at the station as well as sleeping on the officer-in-charge’s chair. Constable Kitty belongs to a nearby resident and the actual name for the cat is Nightro. Officer-in-charge Darryl Brandis said the cat showed up at the station and the staff began feeding it. Senior Sergeant Brandis said the resident was happy for it to nap there. The station has even had to get a second chair into the OIC’s office as Constable Kitty has been sleeping on Sgt Brandis’ shoulders and chair.